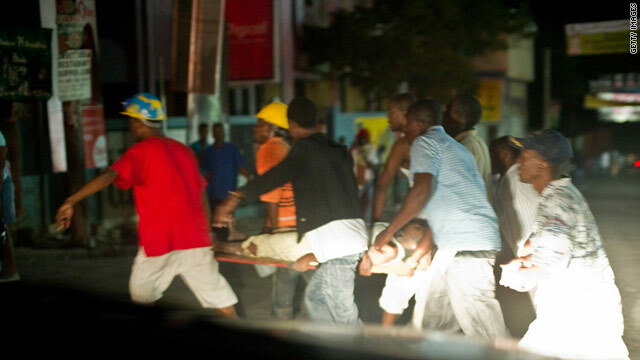 An injured Haitian is carried on a litter shortly after a magnitude 7.0 earthquake struck near Port-au-Prince. (CNN) -- 11:45 p.m. -- "Can hear people gathered in the distance singing prayers," wrote Richard Morse, hotel manager at the Oloffson Hotel, wrote on Twitter. 10:32 p.m. -- Haiti's infrastructure world's worst even in the best of times, says country's ambassador to the U.S.
9:13 p.m. -- U.N. headquarters in Haiti collapsed, U.N. officials say. 8:45 p.m. -- Eyewitnesses report heavy damage and bodies in the streets of the capital. 7: 56 p.m. -- U.S. State Department told to expect "serious loss of life" in Haiti. 6:50 p.m. -- Tsunami watch canceled. 5:23 p.m. -- A tsunami watch is in effect for Haiti, Cuba, the Bahamas and the Dominican Republic. 5:14 p.m. on Jan. 12, 2010 -- A magnitude 7.0 earthquake struck southern Haiti, the U.S. Geological Survey reported.